19-Feb-2006 -- It was a little bit before 7 in the morning as we left Abuja. Nobody was in the mood to get up any earlier. Our aim was to visit confluence 11N 8E. We followed the highway to Kaduna. Several kilometres outside the town at a bush bar with lots of Mango trees we offloaded the bike and carried on with the bike through Kaduna onto the highway to Zaria, which we followed for approximately 15 km. Then we turned onto the A11 and followed this road for something like 100 kilometres till we met up with the Jos to Zaria road, which we followed in the direction of Zaria. It was a pleasant ride through a very nice countryside with lots of Baobab trees and very huge thorn trees amongst the fields. Usually these trees are quite big with well spread-out branches, except that these branches often get cut down because they provide readily source of firewood and animal feeds. When we left Abuja there was Harmattan and it was quite cool. However, in this area there was no Harmattan and it got very hot as it got closer to midday. Around midday we arrived at a small village and we were 100 meters away from the Confluence. We parked the motorbike under a tree to get out of the sun and were immediately the centre of attraction. At the back of this village we found the Confluence. It was quite a task to get some pictures taken without all our spectators. Everyone wanted to be in the picture. In this area the people mainly speak Hausa and English is not very common. Not before long one young lad was brought to us for the translation. The villagers were very curious to know what we were doing there and what possible new benefits will arise from our visit. We amused the kids with our digital camera for a while and left eventually heading for Zaria. 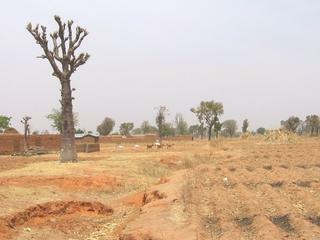 At Zaria we took a drive through the old town onto the highway and than back to Kaduna where we had parked the vehicle. We had an extended lunch under the Mango trees and left only as it got cooler later in the afternoon for Abuja.